Administration is simple: one transaction only to receive the full year's selection. Your subscription price represents a greater discount to you than the alternative of invoicing for your standing order on an issue-by-issue basis. For subscription assistance please call 1800 621 283. 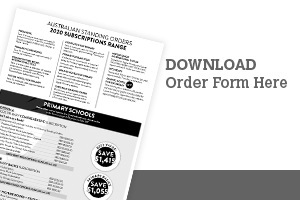 To print an order form for your 2019 Subscription, click here.